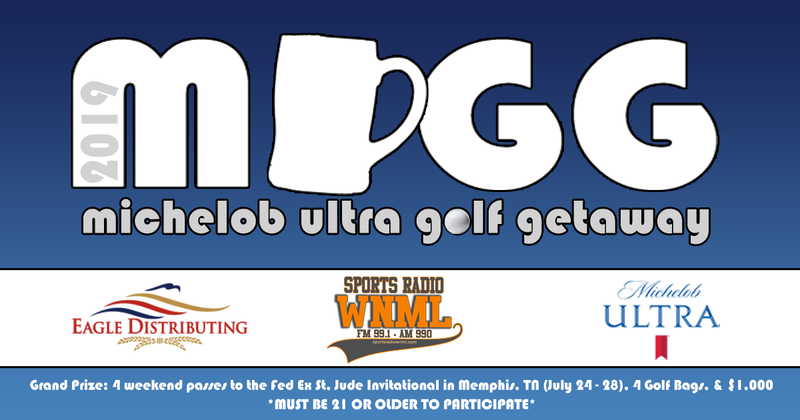 Remote Broadcast: Attend a Michelob Ultra Golf Getaway remote. Complete and submit an entry form. Limit one entry per person per remote broadcast. Six (6) qualifiers will be drawn at the end of each remote. broadcast qualifiers and draw one entry at random from all valid qualifiers for the Grand Prize. A total maximum of 97 qualifiers will be selected at random by the Station from on-site registration. At approximately 6:10 pm ET on May 3rd, 2019 one (1) final qualifier will be selected from the entries received during the final remote broadcast that day. Immediately following the selection of the last qualifier, Station will conduct a reverse drawing among all qualified finalists to determine the grand prize winner. The Drawing will be held at Fieldhouse Social located at 2525 University Commons Way, Knoxville, TN. All finalists will be required to check in at the grand prize remote location on May 3rd between 5:00pm-6:00pm ET and present a valid government issued photo ID. Any finalist not checked in by 6:00pm on that date will be disqualified.